NGC 299 reveals its most massive stars. Hubble reveals the glorious jewels of NGC 299, a cluster of stars that shows what stellar colors mean. Open clusters—sometimes still called galactic clusters, though that’s an old-fashioned term—are beautiful. They’re clumps of stars ranging from dozens to thousands of members, all occupying a relatively small volume of space. Usually they’re bound together by their own gravity, but over tens or hundreds of millions of years (sometimes even more) interactions between the stars in the cluster fling members away. Many of the stars have life spans much shorter than this. The most massive ones fuse hydrogen in their cores much faster, making them brighter, hotter, and bluer. 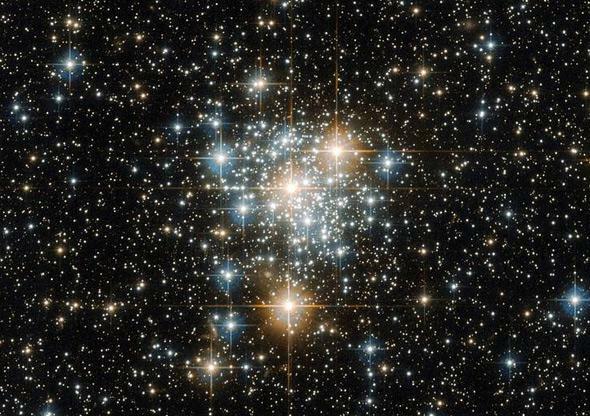 So why, in the Hubble image of the open cluster NGC 299 shown above, are some of the brightest stars red? It’s because those are massive stars that have stopped fusing hydrogen into helium in their cores. The inert helium has built up in their centers, getting tremendously hot. This extra energy gets dumped into the stars’ outer layers … and when you heat a gas, it expands. So too these stars have swollen up, growing huge. That means their surface area has expanded, and the amount of energy they radiate per square centimeter drops. They cool, and turn red. Astronomers, clever folks that they are, named these kinds of stars red supergiants. Although cooler than their blue brethren, they are so big that their increased areas more than compensate for the lower temperatures, and they shine tremendously brightly. So even though the blue stars in the cluster are brilliant, the red ones can be just as luminous. It’s also possible these supergiant stars have evolved even further, piling up enough helium in their cores to begin fusing that into carbon. Those can have inert but incredibly hot carbon cores, with thin shells of helium and hydrogen fusing outside of it. The details can be complex, but in the end it all points the same way: The stars are in their end stages, and will soon explode as supernovae. So look again at that photo. The three bright red stars are probably the most massive stars in the cluster, and were once blue. This is more than just an interesting piece of scientificness. It’s also a powerful tool: Using sophisticated models based on decades of knowledge learned about stars, we can calculate how old a star will be when it changes from a blue “normal” star to a red giant. This happens to more massive stars first, so by measuring the most massive star that hasn’t yet become a red supergiant, the age of the cluster can be found (assuming all the stars formed at the same time, a reasonable assumption). And indeed, NGC 299 is young, about 15 million to 20 million years old. How cool (or hot) is that? Although there are lots of details to consider, just by glancing at this image, I can tell you quite a bit about what you’re seeing. Now consider this: NGC 299 is 200,000 light-years away! It’s not even in our own galaxy, but instead in the Small Magellanic Cloud, a satellite galaxy to our own. Lots of much closer clusters look like this through my own telescope, but thanks to the power of Hubble NGC 299 lets slip its secrets to us. I talk about how stars evolve over their lifetimes in Crash Course Astronomy: Stars, and go over clusters in another episode. Here’s the cluster one for your edification. And as a final note: These supergiants, in death, seed the galaxy with heavy elements necessary for the creation of more stars, planets, and the basic ingredients for life. In death there is life, which is true on the scale of microbes and humans and the stars themselves.